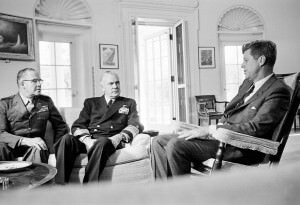 In this Oval Office meeting on the 14th day (October 29, 1962) just before lunch, Marine Corps Commandant General David Shoup and Chief of Naval Operations Admiral George Anderson gave Kennedy a sense of what an invasion of Cuba might look like. calibrate their military planning to the size and nature of the Soviet military presence on the island. In recent days, low-level surveillance photos had revealed the presence of four combat regiments, each with sophisticated battlefield weapons, including nuclear-capable short-range rockets known as FROGs (or Luna to the Soviets). But even with those unknowns, they were also very confident in a quick victory if ordered to invade. It would start with waves of air strikes and end with storming the beaches. “We’d really make a shambles” of Cuba’s defenses, Anderson predicted. David Shoup . . . and now all these pieces of equipment are gone. And we don’t know how many are in how many other places. Of course, they’re searching the previous U-2 photos now to get a signature of like camps, and they found two more. But, of course, in that photo [high-level] you can’t tell what’s in there. It takes the low-level job [surveillance flight] to get that. [Unclear.] So we really don’t know how much they’ve got. But we have to find out, which can be done. And it’s done at a price. After you do your air [strikes], you continue to do your air [strikes], everything [unclear] you take them out, every airplane . . . And then you can take that place, absolutely. Now, what they would do with a nuclear weapon if they [unclear], I don’t know. I think they’d shoot them. Then the question is: are we at nuclear war? JFK Well, now what if they didn’t use their nuclear weapons, but used those armored vehicles, self-propelled and all the rest, given the fact that probably the younger Cubans are loyal to Castro and have enough national spirit, even the ones that don’t like Castro, so that we would certainly run into a hard-core situation with a lot of guerrilla [forces] and, as well as . . . You think that, your judgment is, that it’s not a major military effort or—? Shoup It will be a major military effort, yes sir. But, once you hit this place, then you go at night, you take on every troop movement. See, they [the armored vehicles] are confined to one longitudinal highway, about two tracks, which means that if they’re moving any sizable tanks or anything else, you can take them on at night, with a flare. And you can get pictures of what they’re doing. You see, at the Guantánamo end [of Cuba], for example, our people believe— well, I think they pretty well know from their obliques [aerial photography from flights off the coast]— that they’ve [the Cubans] got positions prepared back there about, oh, maybe, 15 miles, and inland. But they feel that they have the troops and all the stuff that they would move in there, including, perhaps, this kind of stuff that we saw in the regimental area. It would take them [the Cubans] two nights’ march to get into those positions. They’re not occupied. But they’ve got them and, of course, the thing is, you strike a place like that camp that you saw them all lined up here [unclear interjection by President Kennedy] spread out. It just takes that much longer to get ahold of them. JFK You would take out those vehicles which have a—unless you’re using nuclear . . . can airplanes . . . that one picture where they’re all in a row, what would you take them out with? Shoup Oh, see you’ve got rockets and napalm [unclear]. George Anderson Oh, [unclear] with rockets and napalm. JFK Rockets? Would that take them out? Anderson And the 250-pound low-drag bombs, which we carry a lot of on our planes. Anderson But we’d really make a shambles of it. But the three things that concern me was: First, did we find all of these missiles and weapons? Anderson Second, what would they do in the ports, in the way of demolitions, which might impede the getting ashore of the armor, particularly for the Army. And, third, whether they might have a very elaborate demolition plan on these airfields. These things we really wouldn’t know until we got in there. Shoup Not until our last pictures did they find any beach defenses going in on this one of the beaches that we’ve planned to go in on. The latest pictures—and the intelligence officer said he forgot to tell us that this morning— that the latest readout on that shows them busy constructing defenses at the beach. It’s—Of course, mines cause a trouble. But you find out before you go in, and you take some moves, measures to get rid of the damn mines. You can go in and unarm them, you see. Boys swim in the water and unarm them. Tape 43, Presidential Recordings Collection, President’s Office Files, John F. Kennedy Library. Excerpted from a transcript to published in David Coleman, ed., The Presidential Recordings: John F. Kennedy, volume 4 (New York: W.W. Norton, 2013).